Whatever the kind of business you’re in, a good analysis deserves a tailor-made report. With DashThis, you get to add your own logo, include comments and merge your data into simplified widgets. There’s no such thing as a “universal analysis report”. Just show your results the way you want to. When you’re satisfied with your dashboard, automate it! DashThis will do the rest for you. Just select the specific period you want your report to track, and there you go! No need to duplicate and overdo the work. We're guessing you're not creating your dashboard for yourself… Now that your analysis report is done, it’s time to share the love. Whether you better like to share it as a PDF, a URL, or directly by email, it’s no problem. Either way, rest assured that your confidential data is encrypted and secured by a password. It’s way easier to get the big picture of your business by gathering all your metrics. 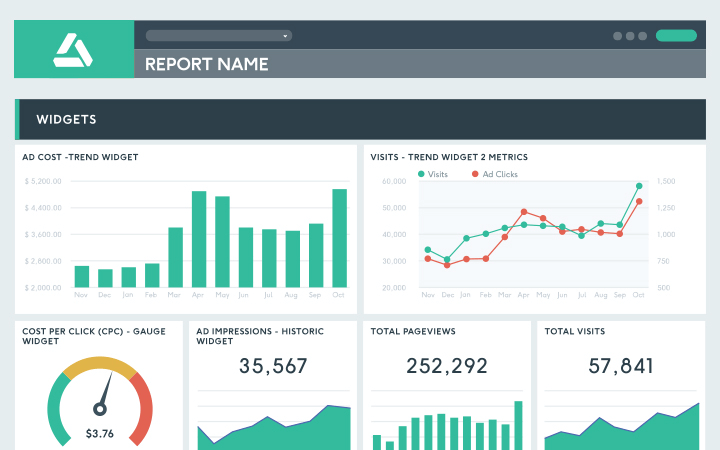 Because analysis reports often include a vast number of platforms, DashThis works hand in hand with 30+ integrations. From Google Analytics to Facebook Ads or Google AdWords, you’ll be able to directly connect the tools you use on a regular basis. Communication between agencies and their clients can sometimes be laborious, but a well-done analysis report is certainly bound to help with that. Even better: it’ll make you save time in the long run. That’s exactly the reason why so many agencies and marketers have trusted us to simplify their lives: so that they can use the extra time to create more value for their clients! Our objective is clear: to keep the creation process of an analysis report as painless as possible, while offering all the features you need. We achieve that by delivering a complete, easy-to-use product with a clean, intuitive design, which you can use easily without any help from your IT specialist. Pretty great, huh? Pay for what you need. Your business analysis only requires the use of three dashboards? No problem, just select your desired plan. Can’t find your perfect plan amongst the ones we suggest? That’s alright, just talk to us and we’ll customize one for you. Replace the standard DashThis dashboard URL with one branded to your company (reports.yourcompany.com maybe?). Save on a custom URL and design with a white label bundle that includes both! An analysis report just the way you want! Check out our Google Analytics report template! Our blog is full of analysis reporting content! Want to get the most out of our reporting tool? That’s what our blog is for! And if you want to get content right in your inbox, sign up for our newsletter. We won’t spam you, we promise!